I have taught many “Anthonys” over the years. Mostly because I was willing to take on the piano students that were deemed “too difficult” by other teachers! In fact, I gained a reputation in my area for being the go-to teacher for squirmy, wiggly, excitable, and just plain wild piano students. Lucky me. I got used to hearing the warnings that (some!) parents would give me… “I’m not sure how he’ll do with 30 minutes”…“She has a bit of trouble focusing in school”…”He has a lot of energy”. In the beginning (I’m not going to lie) it was tough. Kids liked me because I was kind and fun – but inside I was struggling. Those 30-minute lessons haunted me in my sleep. 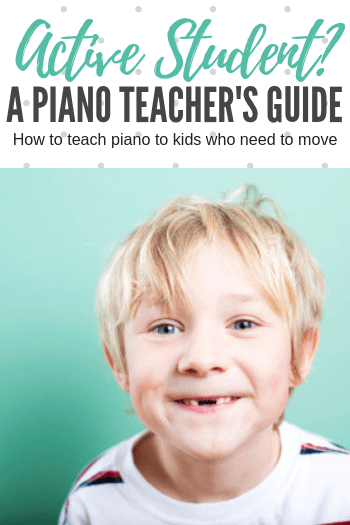 However, the day that one particular student attempted to climb my french doors was the day I decided I needed a real plan… a “How to Teach Piano to Busy Students” plan. 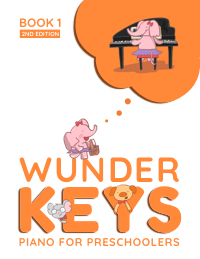 So… let’s stop climbing my door and learn to play the piano! 1) Set the tone for energy level – I used to be a camp counsellor. I can ramp up a crowd of children with the best of them. In the beginning, I made the mistake of matching the energy level of my Anthonys. I (mistakenly) pulled out all the stops to keep them entertained and did everything short of magic tricks to keep their attention. I was a one-woman circus. But the one-woman circus was misguided. Rambunctious children feed off the energy of others, but they don’t have an easy-to-find off switch. You’re setting them up unfairly if you yourself are “pumped up”. Set the tone for the lesson by projecting the energy level you’d like to see from your piano students. Think zen. They’ll learn to mirror your energy. 2) Remove distractions… and disasters – While I couldn’t remove my french doors… in retrospect, the grate on the outside did look surprisingly like a ladder! And while you can’t predict every distraction your piano student will find – you can certainly remove the obvious ones. Become an extreme minimalist for their lesson time. If they only have you and their music to focus on you’ll be much more successful. 3) Teach in chunks – Separate your lesson time into at least 5 different zones. But make these zones predictable. Calmly direct your student through a multi-activity lesson. Be fair to them – they simply can’t sit still for 30 minutes. As much as you may try to glue their bottom to that bench… you’ll lose that battle. 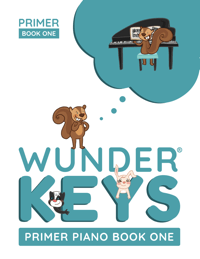 Find ways of reinforcing their learning off the piano bench. But don’t give in to the “Can we do the rhythm game now?” type requests before you’ve finished the previous activity. Anthony will learn to predict what he has to accomplish before moving on to something new. He loves to move on to something new… so make him work for it. 4) Meet your new friend… the piano lid – My piano lid was never closed. My Anthonys changed that for me. It was next to impossible to truly have them listen unless the keys were off bounds. Never talk over “noodling”. Close the lid and have the patience to sit and (kindly) stare until he realizes that you are waiting for him. Silence on your part is extremely effective. Use it to regain control. 5) Give him a reason to listen – You can adopt all of the behaviour modification strategies in the world – but if what you’re offering is boring it will never work with an Anthony. 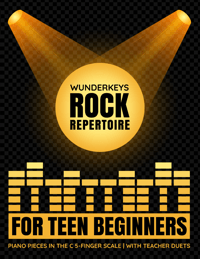 Be extra creative in your approach to piano lessons – give him repertoire, games, and performance opportunities that are “worth it” for him. Be aware of different learning styles – only explaining something aurally will not work for all students. Find ways of giving the same information visually, aurally and kinaesthetically. 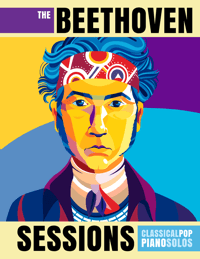 The “Anthonys” in your studio may never become concert pianists. They may progress through their method books slowly. They may play their pieces with the grace and sensitivity of a water buffalo. And while they may require much more work than any other kind of piano student in your studio, the results can be worth it. I find nothing in my career to be more rewarding than watching my “Anthonys” play the piano in our end-of-year recital… knowing that had it not been for me and my persistence he would not be able to do so. Not all gifts worth giving are easy. This gift is worth the work. Active Students Love Action-Packed Music! 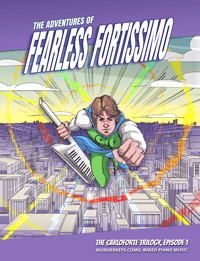 If your active “Anthony” is craving action-packed music, then you can turn to The Adventures of Fearless Fortissimo! 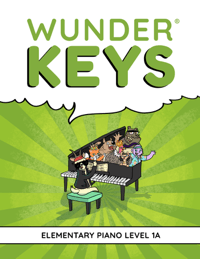 This comic-based supplementary piano book series is filled with stories and illustrations that captivate and music that motivates. 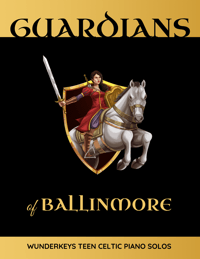 Find them on Amazon here.